I did not sign up yesterday. I did not sign up from a train. Most days I don’t even drive a mile. If you’d ask me I’d tell you no. I simply did not sign up yet. I would rather take a nap. Well crap, I guess nothing rhymes with Bluemix… This will forever be unfinished now… Sigh…. 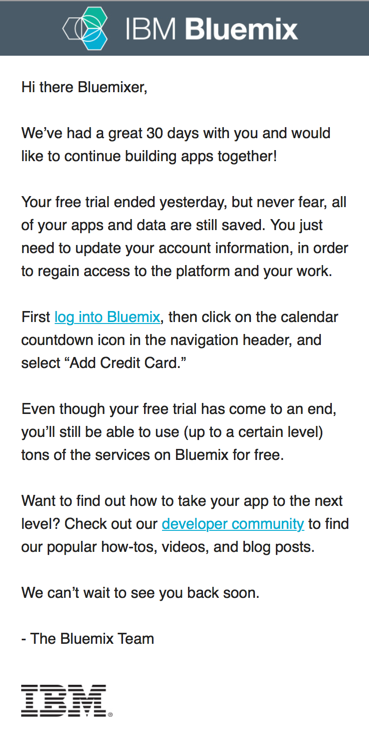 Way back in November I blogged about getting some similar emails from Bluemix. I didn’t like it then and I don’t like it now. 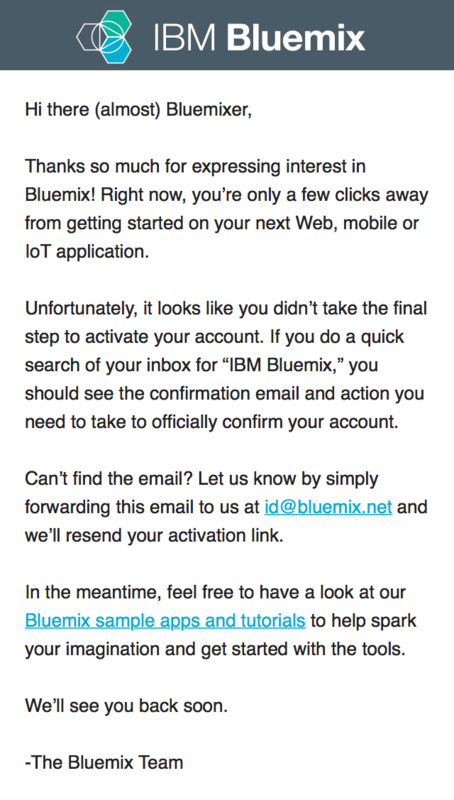 I don’t like the wording, as again, I’ve not signed up, validated an email address or placed any apps or data on Bluemix. I really wish IBM would cut this out. People don’t need to be tricked into using Bluemix. It’s a turn off. Just make Bluemix as great as you can and people will come. I’ve heard a lot of good about Bluemix from the recent IBM Connect conference. And with new updates into Domino Designer I’m probably getting closer to actually giving it a try which is why getting this in my inbox is extra annoying. If I sign up today I feel like I’m giving into a phishing scheme. And can I even sign in? It says my trial period has ended? I bet there’s a good chance that’ll be a pain to sort out. update: Changed the title on suggestion from a friend to “Bluemix and Spam”. That sounds better. Come on Bluemix. You’re better then this. Let’s be clear. I AM interested in Bluemix. I’ve had several NotesIn9 shows dedicated to it already and I’d like to get more. I do want to play with it myself – especially the XPages experimental bits. Even forgetting about XPages stuff, Bluemix seems to have a wealth of capabilities. It looks like a developers candy store. Sadly I suffer from a lack of time, knowledge of the options and I still some trepidation over possible costs and capabilities. So for now, I’m watching and waiting for a good opportunity to check it out. But that doesn’t mean I want to be “tricked” into using it. I recently found 2 emails in my inbox about Bluemix. The first email came to an address that I rarely use because it’s from my wife’s laser engraving business’s domain. Contrary to what the email says I did NOT sign up for Bluemix at that address. I THINK I used that address for Lotusphere in 2010 because my company at that time, refused to send me but I’m not sure. I know I did not use it for anything Bluemix related. The second email came to me at a different, more common address that I use. While I honestly don’t think I’ve ever registered for Bluemix, it’s possible I might have under that address a long time ago. But the fact that I don’t actually have a “confirmation email” in my inbox makes me a little suspicious as well. 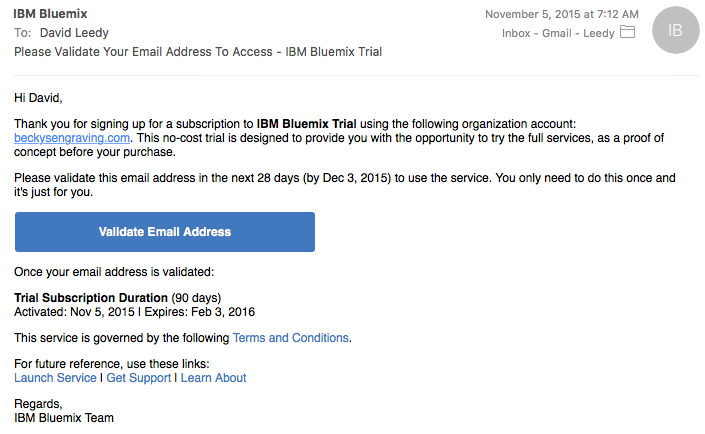 To be honest, both emails feel like SPAM type tricks where my emails addresses, given to IBM for other purposes, are re-used to try and trick my into signing up for Bluemix. Hopefully this was an honest mistake somewhere down the line. If not then I’d simply ask IBM / Bluemix to not do this. Don’t try and trick people into using your tools. Just make the best tools you can and people will want to give it a try. In this show IBM Champion Oliver Busse concludes his 3 part series on getting started with XPages inside IBM Bluemix. In this show IBM Champion Oliver Busse returns to talk more about using XPages inside IBM Bluemix. In this show, IBM Champion and all around awesome person, Oliver Busse returns to kick off a three part series on using XPages with IBM Bluemix. Ok I’ll admit it.. I’ve not really been paying much attention to IBM’s Platform as a Service offering called “Bluemix”. For the longest time there was no XPages component. Of course I’d love to play with all the other technologies that it offers, and there are a lot, but as primarily an XPages Developer at the moment I just don’t have good time or practical ideas for anything else. Then they finally put XPages and the “XPages NoSQL” database into Bluemix. Experimental for now, but it’s in there. Now it has my attention. I could run XPages in Bluemix and maybe hook into all the Watson goodness and all the other bells and whistles that they offer. As soon as the XPages Experimental went live I saw several posts by Marky Roden and others and I’m thinking cool, now I can get started. Then I went to MWLug and learned something really REALLY unexpected. Because the Domino server is NOT “Multi-Tenant” it means that the “XPages NoSQL” database is really just a semi-isolated slice of I guess an actual Domino server. I’m not sure of the plumbing. But it specifically means that this “XPages NoSQL” database should NEVER EVER be used for PRODUCTION data. If one customer caused a crash it would take down multiple customers. The “XPages NoSQL” database on Bluemix has only ever been intended to be a “developers playground”. My current understanding is that if you actually do want to use XPages on Bluemix for a production app then you must host the data either on IBM’s Softlayer service or “On premises” with your own copy of Domino. So I guess that you need to subscribe to Bluemix for the “app” but then also pay for the data either in a Softlayer subscription or via Domino licensing. This really REALLY disappoints me and assuming I’m understanding this correctly, I’m not sure I see the point in anyone doing much with XPages and Bluemix unless maybe you just HAD to access some Bluemix specific resource from an XPages application. Maybe there are use cases for this but none that really jump out at me. If I’m wrong on any of this please let me know.